The prehistoric people inhabiting the Early Neolithic settlement near today’s town of Yabalkovo, Dimitrovgrad Municipality, in Southern Bulgaria, had domesticated hens some 8,000 years ago, meaning that chickens were raised in Europe much earlier than previously thought, reveals Bulgarian archaeologist Assoc. Prof. Krasimir Leshtakov. Leshtakov, who is a professor of archaeology and prehistory in Sofia University “St. Kliment Ohridski", excavated the Neolithic proto-city, which dates back to the 7th millennium BC, between 2000 and 2012. The settlement near Yabalkovo was first discovered by Bulgarian paleo-ornithologist Prof. Zlatozar Boev from the National Museum of Natural History in Sofia who found bones from domesticated birds there, and was then excavated by archaeologists. 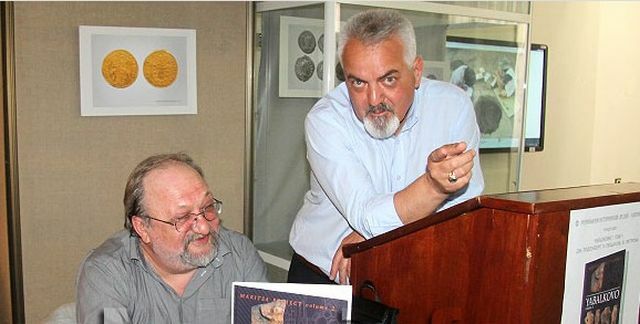 “The first omelette [in Europe] was eaten 8,000 years ago in Yabalkovo," archaeologist Krasimir Leshtakov has said at the presentation of the first volume of his book entitled “Yabalkovo" during the European Night of Museums 2015 at the Regional Museum of History in Bulgaria’s Haskovo, reports local news site Haskovo.info. Leshtakov’s book is co-authored with J. Rodenberg and Vanya Petrova summarizes the discoveries made by him and his colleagues in 12 years of archaeological excavations of the Neolithic settlement near Yabalkovo. 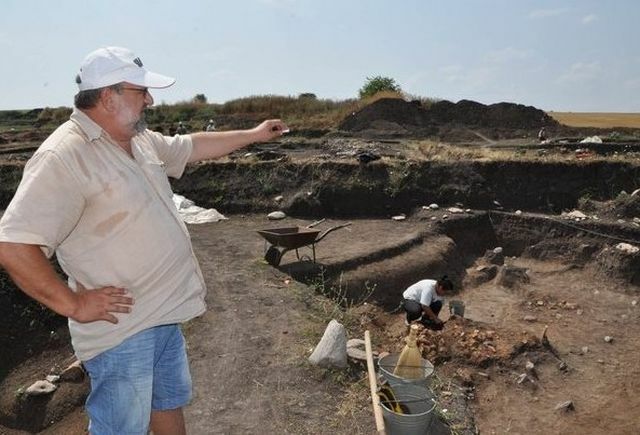 The archaeologist points out the discovery that the prehistoric civilization, which inhabited today’s Haskovo region in Southern Bulgaria, raised domesticated chickens some 8,000 years ago is a breakthrough for the archaeological science. In his words, until recently it had been thought that domesticated chickens became widespread in Europe only after the Arab invasions in the Early Middle Ages (even though there is evidence that domesticated chickens were also known but not widespread in Ancient Greece and Ancient Rome). However, some 8,000 years ago, the prehistoric people at Yabalkovo produced a breed of larger broody hens which could not fly, as indicated by the bones of four broody hens found there. Leshtakov has also explained that the Early Neolithic proto-city near Bulgaria’s Yabalkovo is the largest one of its kind in the Balkan Peninsula. Its civilization first came from Anatolia in today’s Turkey, settled the plain around today’s city of Haskovo as well as the Eastern Rhodope Mountains, and probably numbered several tens of thousands which is a fairly large number for that time period. Based on his findings, the Bulgarian archaeologist says that in addition to chickens the prehistoric people of Yabalkovo also had domestic pigs, alcohol, white and yellow cheese (called kashkaval in Bulgaria), and raised large herds of goats, sheep, and cattle. These Early Neolithic people also smelted copper which is the earliest case of metallurgy in Europe. Another interesting topic explored in Leshtakov‘s book is connected with the fact that the DNA of the Neolithic inhabitants of the region of Haskovo loosely matches the DNA of today’s residents of the same region, which is taken to mean that the genetic heritage of the prehistoric people who lived there 8,000 years ago is greater than previously imagined. The remains of the Early Neolithic proto-city near Yabalkovo have been partly covered by a section of the Maritsa Highway which was built in Southern Bulgaria in the fall of 2013. However, by that time the Bulgarian archaeologists had managed to excavate and research thoroughly its prehistoric civilization. Check out the Background Infonotes below for details about their findings! The Early Neolithic settlement located in an area known as Karabilyuk near Bulgaria’s Yabalkovo, Dimitrovgrad Municipality, Haskovo District, dates back more than 8,000 years ago, to the 7th millennium BC. The site was first discovered by Bulgarian paleo-ornithologist Prof. Zlatozar Boev from the National Museum of Natural History in Sofia. Between 2000 and 2012, it was excavated by archaeologists led by Assoc. Prof. Krasimir Leshtakov from Sofia University “St. Kliment Ohridski" and Dr. Vanya Petrova. Ancient Thracian finds from the Late Iron Age, and finds from the Middle Ages have also been discovered there. The Early Neolithic proto-city near Yabalkovo was first found by Bulgarian paleo-ornithologist Zlatozar Boev after he discovered there bones from 5 domesticated bird species: mute swan (Cygnus olor), two undetermined species resembling geese from the Anser genus, Eurasian coot (Fulica atra), and the bones of four domesticated hens (Gallus gallus f. domestica) which were selected by the prehistoric people to produce a breed of larger broody hens that could not fly. Thus, the Early Neolithic settlement near Bulgaria’s Yabalkovo is the earliest known case of the raising of domestic chickens in Europe. The excavations have also revealed a lot of bones from domesticated livestock such as pigs, goats, sheep, and cattle, and few bones of wild herbivores meaning the Early Neolithic people from Yabalkovo were agriculturalists who did little hunting. Only 3% of their meat is estimated to have come from hunting. They were picky about their rich diet as 75% of the discovered animal bones are from young animals. As indicated by the fish bones and snail shells, they also fished for 10-kilogram carps in the nearby Maritsa River, ate snails (a total of 900 snail shells have been found in a pit on the site). They also grew pistachios, made their bread of spelt (dinkel wheat or hulled wheat, Triticum spelta), and had wine. They also had beer made of sour apples (interestingly, the name of today’s town of Yabalkovo comes from “yabalka”, the Bulgarian word for apple), and probably used formic acid for the beer’s fermentation. The archaeological excavations have revealed that the Early Neolithic settlement had major fortifications. It did not grow over time but was built at once as a huge and complex urban structure covering a circle with a diameter of 2.5 km, with an area of approximately 5 square km. Its fortified core had the area of about two modern stadiums. It had the shape of a circle or an ellipse with a diameter of 210 meters, with two entrances to the north and the south, and was fortified with 3 moats in concentric circles with a circumference of 450-500 meters each, plus a clay-stone wall between the innermost and the middle moat, which was at least 4 meters tall; the moats were deep 3-4 meters, and wide up to 5 meters. They have been located and explored with contemporary methods for geophysical exploration. According to Bulgarian archaeologist Krasimir Leshtakov, the labor invested in the construction of this Early Neolithic proto-city is comparable with the effort for the construction of the earliest Egyptian pyramids. The fortified urban core, which seems way ahead of its time, and could have been seen as typical for much later time periods because of its structure and complexity, appears to not have been conquered for a long time. Inside it there were rows of houses with stone foundations, each with the area of modern-day three-bedroom apartments, with an oven or hearth. The entire core was built-up, without any yards, but with paved passages with a width of 1.5-2 meters between the homes, and with drainage ditches. It is estimated that each house had about 10-12 inhabitants in extended families of three generations meaning that the total population of this Early Neolithic prehistoric city was maybe 2,000-3,000 people. The families probably specialized in different crafts since the Bulgarian archaeologists have found different tools and products in different homes: broken ceramic vessels in one home; a vertical loom in another; more than a dozen of stone tools in a third; a furnace with traces of smelting copper in a fourth. A cult area in the northern part of the fortified city has revealed a stone arrow, a stone 1-meter phallic structure, the graves of a man and a woman in unusual positions, and a large building with a zoomorphic vessel depicting a bull in its foundations which is similar to prehistoric cult buildings found in Ancient Anatolia – in Catalhoyuk and Hacilar in modern-day Southwest Turkey. The building was probably a sanctuary or the seat of a chieftain. The Early Neolithic proto-city near Yabalkovo was a complete and complex society with all elements to satisfy a civilized human’s needs: economic, social, religious. The carbon dating of 14 human bones found near Yabalkovo has revealed that the people buried there died in 6,200-6,100 BC. They indicate that the Early Neolithic women who lived there were slim and had an average height of 165 cm (appr. 5 feet 5 inches), while the men were burly, and had an average height of 175-180 cm (5 feet 9-11 inches). The wearing out of the men’s vertebrae indicates that they carried heavy loads on their backs, and that they had rheumatic diseases which, however, were treated successfully. Their teeth indicate that they ate mostly meat and less bread. DNA tests in a laboratory in Ireland have found DNA similarities with bones from Early Neolithic settlements in Anatolia in today’s Turkey. Contemporary archaeology hypothesizes that Neolithic cultures spread to Europe, i.e. the Balkans, from Asia Minor either through migration, or through cultural exchange between neighboring human societies. Bulgarian archaeologist Krasimir Leshtakov believes that both hypotheses are valid, and that the Early Neolithic people who settled in the Balkans from Asia Minor were not colonists but exiles or refugees chased away by their brethren because they developed a new and distinct culture very quickly. This is taken to mean they were not attached to the place where they came from, and were not colonists driven by a demographic explosion. Several prehistoric cultures formed in the Balkan Peninsula in this way. They do not seem to stem from a single fatherland in Anatolia but instead have more in common with one another, while each one of them has some common features with some of the Early Neolithic cultures in Anatolia. It is assumed that the residents of the Early Neolithic proto-city of Yabalkovo came from Northwest Anatolia, as their settlement shares some similarities with a recently discovered Neolithic settlement near Bursa, Turkey. At the same time, however, the settlement near Yabalkovo reveals characteristic that are more typical of Neolithic settlements in the eastern-most part of Anatolia such as a male deity symbolized by a phallic structure while lacking the female idols or zoomorphic figures found in other Neolithic settlements in Southern Bulgaria. The people of Yabalkovo are believed to have came from Asia Minor by sea, sailing from a location south of today’s Izmir in Turkey to Europe’s Aegean Sea coast and reaching the region of today’s Haskovo through the Eastern Rhodope Mountains or by going up the valley of the Maritsa River. At least two Neolithic settlements similar to the one near Yabalkovo have been found in Southern Bulgaria along this alleged migration route – one near the city of Kardzhali and another one near the town of Krumovgrad. The proto-city near Yabalkovo probably controlled the raft trade traffic on the Maritsa River because the archaeologists have found there “imported" items from other parts of modern-day Bulgaria – flint from today’s Northeast Bulgaria, nephrite from an unknown distant location, precious stones from the Rhodope Mountains, and copper ore from the Eastern and Northern Rhodope Mountains. The richness of the Early Neolithic proto-city near Bulgaria’s Yabalkovo is believed to have led to its demise. It existed for about 600 years. Its mighty fortifications indicate that its inhabitants had a lot to be afraid of. In one of the moats the archaeologists have found the bones of a warrior, a defender, with a 6 cm incision in his skull caused by a stone ax blow. He was probably killed when the proto-city was looted and burned down. 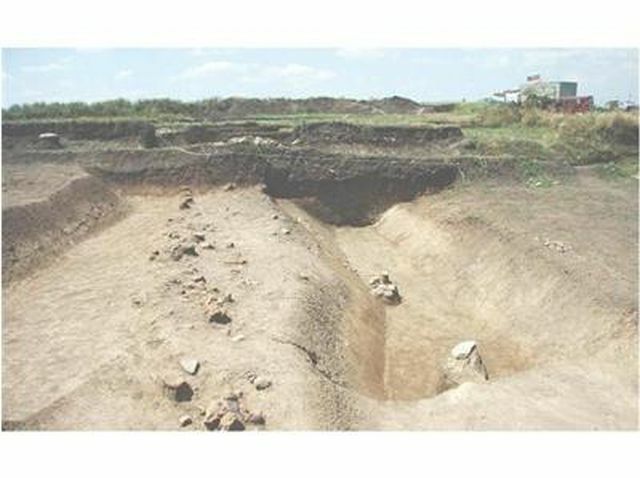 The archaeologists have found no necropolis, only several funerals near the Maritsa River indicating that the prehistoric people connected the afterlife with the river. The Early Neolithic settlement near Bulgaria’s Yabalkovo also appears to be the earliest known site with metallurgy in Europe. Tests carried out in the Berlin Museum of Natural History of smelted copper discovered at Yabalkovo in 2003 have proven that this was the earliest case of metallurgy in all of Europe pushing back by 1,500 years the time when metallurgy appeared on the European continent. The copper ore was probably mined under Mount Aida in the Eastern Rhodope Mountains. A number of artifacts from the Antiquity and Middle Ages have also been discovered on the archaeological site near Bulgaria’s Yabalkovo, one of the most unique ones being an Ancient Thracian bronze statue of a lion with its head turned backwards. The lion statue was found in 2011. It is dated to the 5th-4th century BC, and is the only one of its kind known in world archaeology. In the fall of 2013, after it had been excavated since 2000, part of the prehistoric settlement near Yabalkovo was covered with concrete for the construction of a section of the Maritsa Highway running in Southern Bulgaria.